Editor’s Note: Brett Thomas isn’t scheduled to graduate from Eagle Rock School for a few trimesters, but he already says with authority that his post-Eagle Rock plans include studying criminal justice prior to a career in law enforcement. Brett, who was raised in Boulder, Colo., credits the community service experience he has garnered thus far here at Eagle Rock as having heightened his interest in helping others as a peace officer. As you’ll see below, our focus on service learning — education that integrates community service along with facilitated instruction — not only enriches the learning path but also teaches civic responsibility and results in a stronger community. We asked Brett to discuss the influence Eagle Rock’s service learning programs have had on his education thus far, as well as to tell us more about his future plans. Eagle Rock: Why would you want to perform service for others? Brett Thomas: In the past, I used to think service was incredibly pointless and a waste of time for students at Eagle Rock. But the more I actually involved myself within the community, the more I felt satisfied — I actually felt better about myself. This mindset comes in part from the effects of dopamine. But instead of it being gathered through something unhealthy — such as gambling, drinking or drugs — it’s gathered and dispersed through the more positive aspects of service. Many people my age use drugs to feel better, and they often suffer from the consequences. And while I haven’t taken drugs, I know what triggers people to continuously abuse them. One way to combat substance abuse is through being of service to others without seeking recognition or cash rewards. It’s in the knowing that you can accomplish so much by serving others that enables that emotional dopamine to refill and disperse at healthy levels. Eagle Rock: What benefit does community service and service-learning offer students in general, and in particular, students at Eagle Rock School? Brett: The first and foremost answer to this question is the development of a work ethic. It takes time and effort to become used to the notion of working, but I believe service work opens the door to additional life building skills. You learn how to communicate more effectively with those who surround you, and you also create a stronger bond with people with whom you never expect to establish a relationship. I first experienced this at Eagle Rock when I committed to my family that I would spend 24 days in the woods for my wilderness orientation. I returned stronger than ever, and it took a lot of dedication. Not only was this something I accomplished, it was something I promised and delivered to everyone who was counting on me. Another time was when I performed my first major service project with the local American Legion (Estes Post 119). We had raised money for local veterans and their families, and seeing the satisfied smiles on the people running the event made me joyful that my work went into something greater than I could ever imagine. I built a special bond while working with the American Legion, and I was able to help more than just them. Eagle Rock: Why do you think Eagle Rock includes service to others as a value and foundational element of the school curriculum? Brett: The service learning provided through academics in class doesn’t feel like service. But when you’re volunteering on something like Service Saturdays, you feel you’re actually doing good works for others. One of the great things about how Eagle Rock incorporates service into its classes is that students don’t recognize it as service — they see it more as an academic building activity. An example of this would be the RecreArte class, and how students went to New Mexico to work with the people in Taos. There they learned more about how the environmental impacts our planet and how to build the Earthships created in the area. To me, this felt more like a learning experience than it did service. But in actuality, it was a service. I realized how working with these local folks would help me learn more about their culture. I could feel their passion rather than just reading about it in a textbook or watching a documentary. I was there to experience the actual learning and share what I had with others through my hands-on service learning experience. Eagle Rock: How do you feel service to the community relates to the development of a moral and ethical code? Brett: The obvious answer would be, “Service is a good deed and therefore it’s a good thing to add to your morals.” However, I have a more in-depth way of explaining it with more passion and codex that fits into my morals and ethics. The great thing about morals and ethical codes is that they are yours for the taking and nobody can judge them. What I see in service commitments are people who can build on these codes, enabling them to strengthen their morals and ethics by experiencing hands-on activities. These deeds allow for more sentimental value, as well as increased impact on themselves and others. An example of this might be by vocally claiming your distain for playing a vulgar game such as Cards Against Humanity. Refraining from playing this game is a step in the right direction, but not indulging in anything that approaches your notion of vulgarity only serves to strengthen this moral resolve. Eagle Rock: Tell us something memorable from your service or service-learning experiences as an Eagle Rock student. Brett: The bench I constructed for my legacy project was definitely something I took away. Surprisingly, this wasn’t because of the end but instead — the journey. The bench reminds me of what it means to build a stronger work ethic, an influence for others to follow. Every time I look at it, I think about what cooperation I made with John Guffey, our service learning instructional specialist, as well as the support from other students. It became more than an individual project; it became a group project. This makes me think about how the purpose of service is collaboration — working together as a team instead of being a lone wolf. You think about the whole aspect of what service is and you begin to think about how its meaning is different to others. It also defines itself by how you experience service. Eagle Rock: How has service and/or service-learning affected you as a member of the Eagle Rock community? Brett: I’ve seen myself become more supportive toward service projects that involve community building, as well as playing my role as a leader within the community through service. The idea I see in service is to think about how you can work with others to create a better atmosphere or future — whatever you’re passionate about — with other people by your side. I see myself being this kind of person, and by making the big step to join the Restorative Justice group. That group works with other students and staff to collaborate for a better community and a better system that supports struggling students. Eagle Rock: What impact has service and service learning had on your thinking about public service beyond Eagle Rock? Brett: Well, I’ve already made up my mind about what I would like to do after Eagle Rock, and I believe the service I’ve learned and provided here will benefit me greatly by becoming more open in my support of other communities. I would love to be out supporting the public more by educating myself on our government — similar to what we did back in the spring of this year during ER-71’s EagleServe. Eagle Rock: How does service relate to your thinking about career aspirations? Brett: I discovered my job interest before arriving to Eagle Rock, but I could never put a name to it until now. I’d love to be a police detective after I graduate from Eagle Rock School. I want to receive associate or bachelor degrees in Criminal Justice and Law Enforcement before heading out into the big world of politics, bureaucracy, and especially dealing with prejudice. I am looking forward to changing the image of how police are viewed in my community, and discover what I can do to support my community and change the avatar that is placed onto police and crime. In what ways might service be part of your life after Eagle Rock? Brett: As a detective, I’d be looking to support other people in the world by critically thinking about how I interact with others. I would love to continue making those connections within my neighborhood through service. I’m looking forward to protecting my community from threats instead of false flags, and I would love to use the permissions I’m given to help serve my community and not destroy it through abuse. 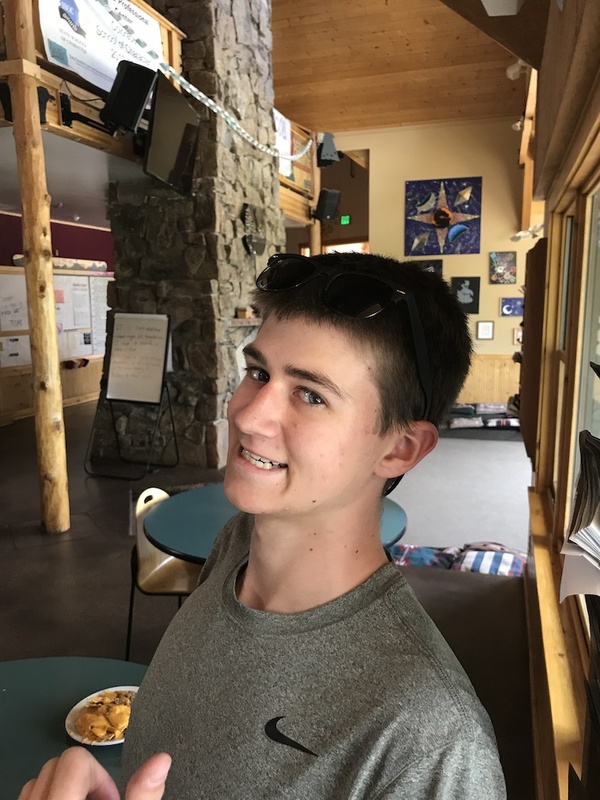 This entry was posted in Meet The Student and tagged American Legion, Brett Thomas, EagleServe, John Guffey, RecreArte, Restorative Justice, Service Learning.